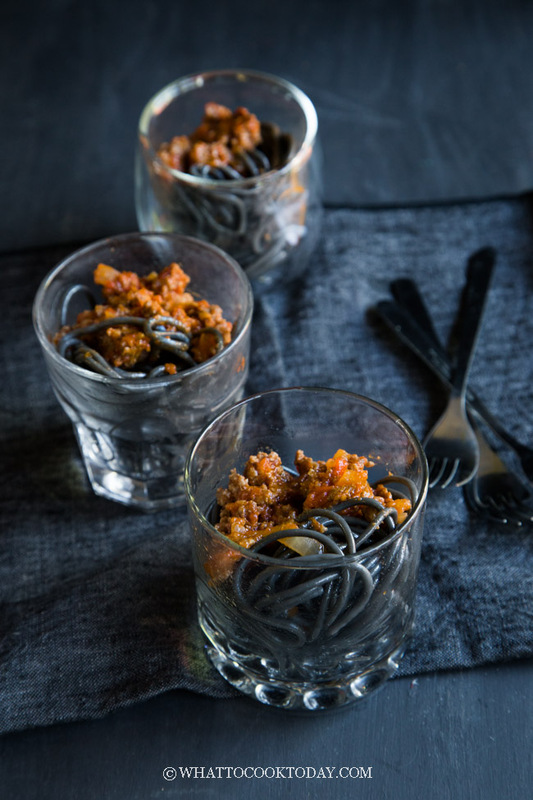 This Halloween Squid Ink Spaghetti Worms with Bolognese is a perfect party food to celebrate Halloween. Can be served in cups or plates. Perfect for kids and adults. Halloween is just around the corner. My kids remind me of that fact every single week if not day! I want a dinner that both the kids and adults that truly enjoy. Pasta menu always seems to go well with both. 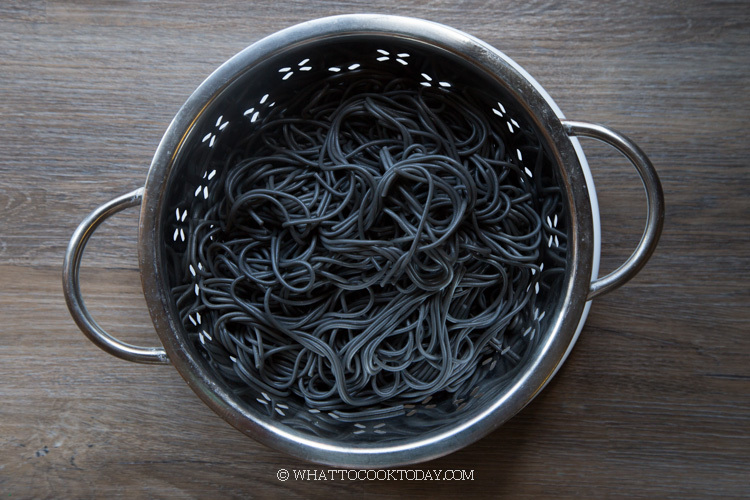 I made fresh squid ink pasta from scratch a while ago when hubby got me a jar of squid ink. 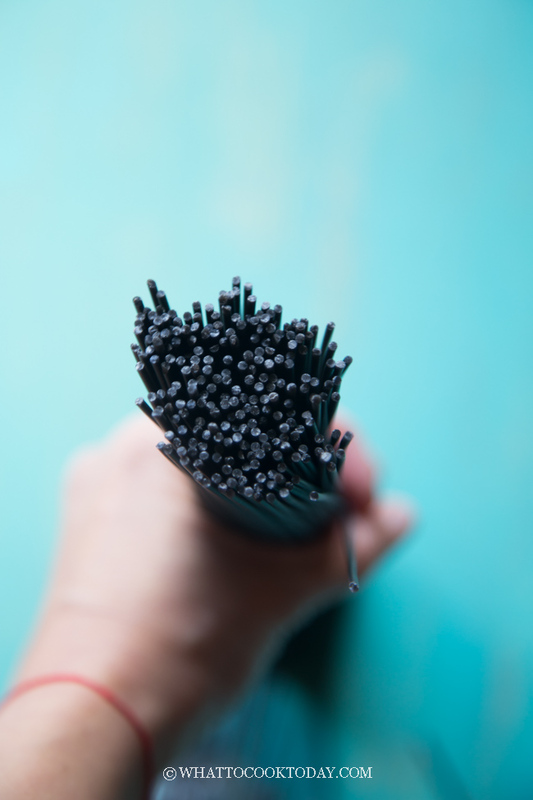 I didn’t make the squid ink spaghetti from scratch this round. 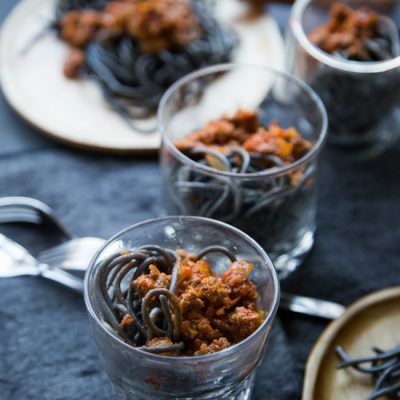 I saw the dried squid ink spaghetti from Trader’s Joe and decided to make this squid ink spaghetti worms when I saw it in Food Network Magazine October 2018 edition. I normally would not suggest that you rinse the pasta with cold water after cooking. 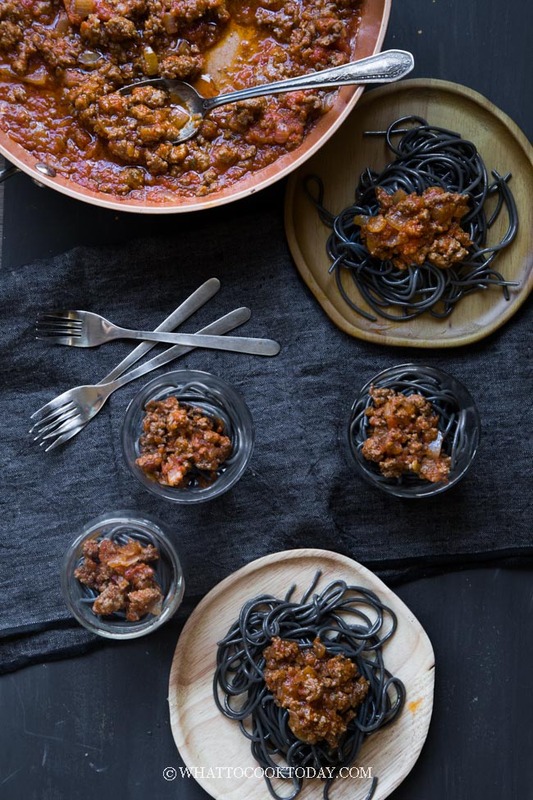 If you were to cook this as normal weeknight/weekend meal, I would add the pasta to the sauce and add the reserved liquid from cooking the pasta too and let it abosorb the sauce. 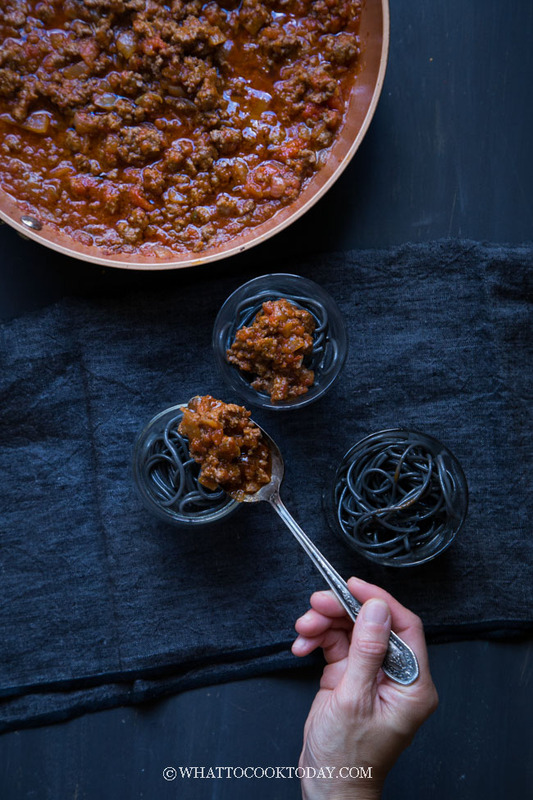 You can still serve the pasta already tossed with the bolognese sauce too. 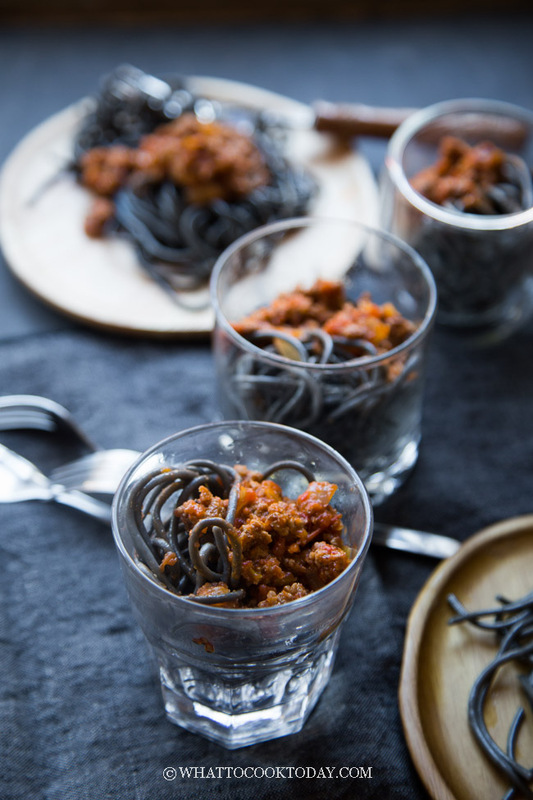 If you really want to see the distinction between the pasta and the sauce, then I suggest rinsing the cooked pasta with cold water and then portion it out into cups or plates and spoon the sauce over. It’s up to you! We don’t really celebrate halloween until we have kids. 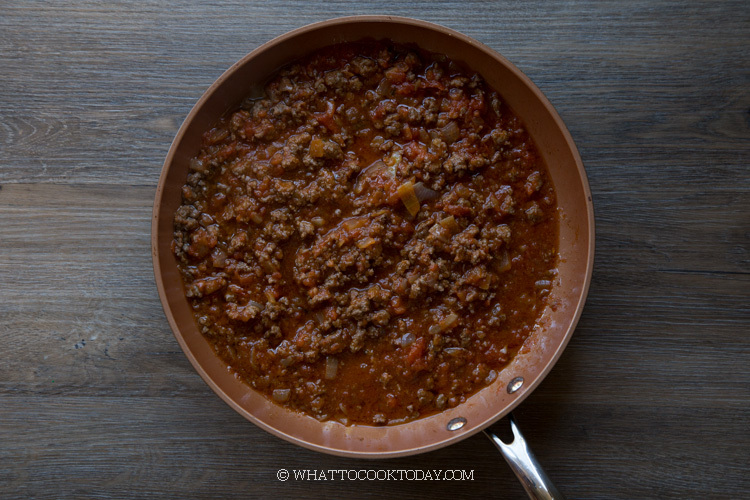 This dish is perfect as regular weeknight meal. It’s easy to make and well-received from kids to adults. 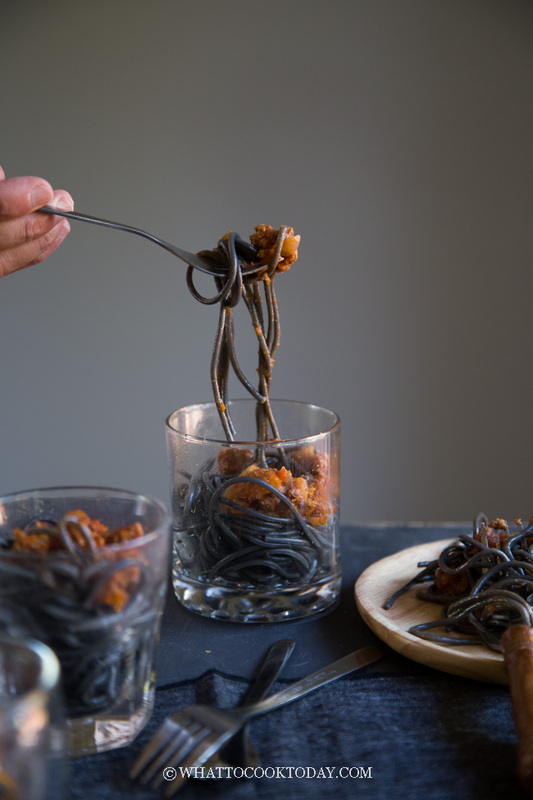 My kids thought that eating black worms spaghetti were so delicious, especially the 4-year old boy, he felt “mighty” just being able to eat worms! tasty ones too! Now if eating worms is delicious like this, perhaps we should eat worms more often! Idea is adapted from Food Network Magazine October 2018 edition. 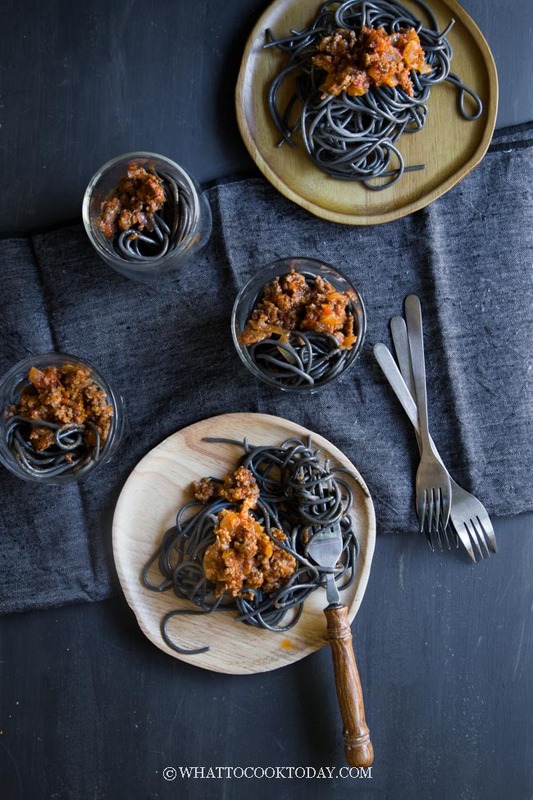 Option 1: Portion the cooked spaghetti into small cups and just before serving, spoon the sauce over the top and sprinkle with some grated cheese.